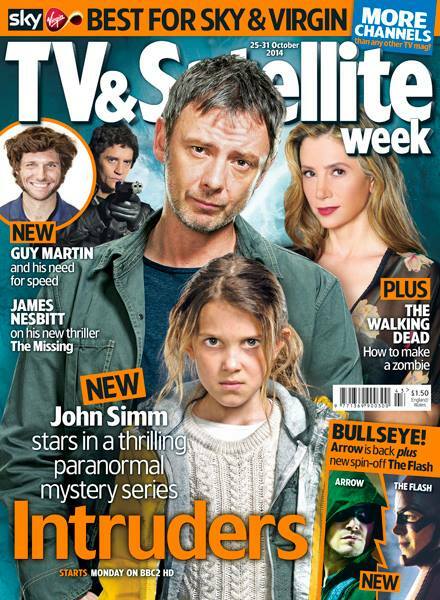 TV & Satellite Week talks to John Simm headlining in an intriguing new US drama Intruders about a troubled marriage and a mysterious secret society (premiers Monday, BBC2). Intruders sets up some tantalising mysteries, doesn’t it? Your character Jack, a former LAPD cop, seems quite complex, with a hidden back story? You seem to have a knack for choosing quality projects to work on – from State of Play to Life on Mars? How did you get on with doing an American accent on TV for the first time? Why are so many Brits headlining American shows these days? John Simm (as Jack Whelan) is headlining an intriguing new US drama, Intruders about a troubled marriage and a mysterious secret society. Did the American crew on Intruders know you from your TV work? Intruders features children in peril. Is there material you won’t watch now you’re a parent? Do your kids watch you on TV? Tags: actor, bbc 2, Drama, Interview, intruders, john, paranormal, simm, Television, thriller, tv. Bookmark the permalink.